Anxiety is the emotion one might most associate with Michel Majerus’s work, both when thinking about the artist’s too-short career and when confronted with the array of works that Matthew Marks has mounted across three spaces, the largest-ever showing of Majerus’s art in the US. Majerus, Luxembourg-born and Berlin-based, died in a plane crash in 2002 at the age of thirty-five. According to his biggest supporter, the Moderna Museet’s Daniel Birnbaum, by the mid-1990s Majerus was the most ‘contemporary’ artist he knew. 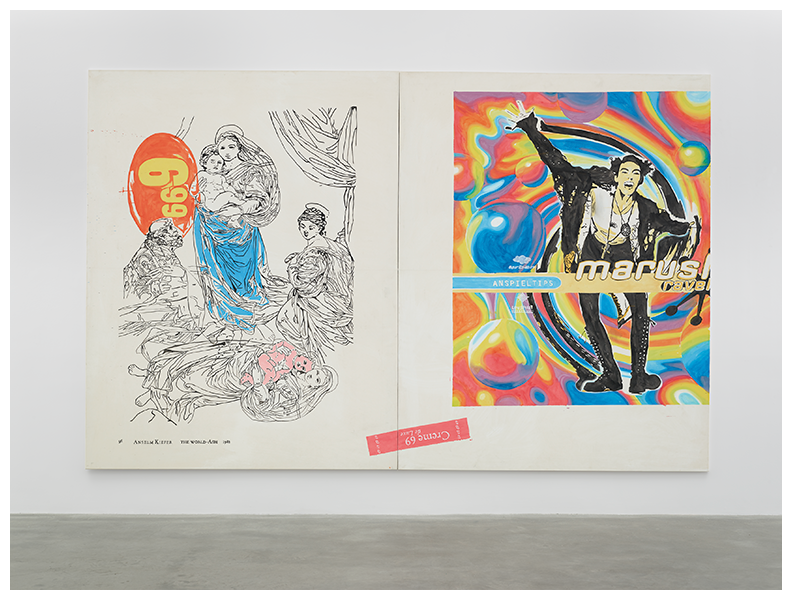 That assessment comes in part from a familiarity with Majerus’s omnivorous approach to imagery and the apparent ease with which he was able to discard debates over painting that had consumed the previous decade and generation. Mournful or melancholic? Critical or complicit? Once the stuff of shouting matches in museum lecture halls, such questions about painting’s remit must have been hard to hear under the thump of techno beats in Berlin after 1989, when the wall fell, history ended and we all became contemporary. Whether you take your end-times thinking in the original Hegelian or prefer the lighter, more easily readable neoliberal version that Francis Fukayama began to peddle at the dawn of the 1990s, the period between 1989 and 1995 was indeed anxiety ridden. The only two works in the Matthew Marks show that date from this period, SOMEBODY WANTS TO BUY ALL YOUR PAINTINGS! (1994) and o.T. (69) (1994) betray a cheeky paranoia, not just about the market (‘Who wants to buy my paintings?’) but about art history: both works appropriate pieces that Warhol made in between 1985 and 1986 – end-time works in themselves (Warhol died in 1987) – and o.T. (69) includes nods to Anselm Kiefer and “The World-Ash”; so, back to Hegel and the ‘end of history’ via Wagner. Is it any wonder that we needed raves the early 1990s? But then it is easy to get stuck in the web of Majerus’s links: ‘Is that from Super Mario Bros.?’ ‘Is that late De Kooning or camouflage?’ ‘That looks like Ruscha’s OOF but in inverted colours and crappily done.’ ‘Whose face is that next to Tron?’ By the time of the browser wars of the mid-1990s, the tech business and the economy were beginning their boom, so no one was thinking too hard about the answers. Given all the cribbing and quotation and the speed with which it all appeared (Majerus produced something like 1,500 works during his short career), what’s obvious to note, at least, as many have, in retrospect, is that Majerus brought the promiscuity of the Internet’s image culture to bear on his artistic work in a manner that few artists have. What’s also important to note, as few have, is that Majerus relied heavily on scale – going big, very big – to give his work weight. Many works’ dimensions go over two metres, the effect of which is to inflate their contents to foreign proportions. It’s a quintessential pop manoeuvre. Warhol introduced it. Rosenquist probably perfected it. In Majerus’s hands it’s symptomatic of a tenuous touch, a need to get across to and, perhaps, connect with, or touch, an audience that is being blown ever further away from painting, and itself. Published in the May 2014 issue of ArtReview.